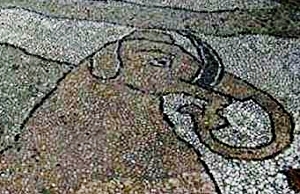 At Otranto in Puglia stands a Cathedral with a floor one great mosaic, laid down around the year 1000 A.D. It is a signed work of art, created by a monk called Pantaleone. He has placed Indian civilisation, symbolised by the small-ear elephant, at the very root of the Tree of Life. Should one be surprised that, in our search for the origins of Turnout, one finally comes across it in India, the earliest great civilisation known to Man? A civilisation whose extraordinary success over the millennia, is proven by the exuberant life of its one and a half billion human beings? On the Indian sub-continent, the spiritual role of the dance is fundamental and indubitable. 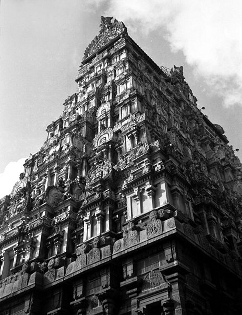 Temples as mighty as the Cathedrals of Notre Dame de Paris or Reims are devoted to it, such as Hoysaleswara at Halebid in the Karnataka or Minakshi at Madurai. Spilling from countless sculptures, bas-reliefs and frescos, where we have saints and prophets, the dance leaps out at us! 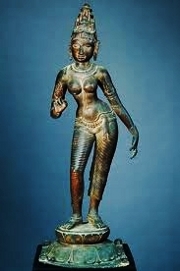 Between the Tenth and Sixteenth Century A.D. were built five temples, whose statuary represents all the 108 karanas (proto-enchaînements) of the Indian system of dance: Rajaraja or Brideshwara at Thanjavur (Tenth Century), Sarangapani (Twelfth Century) at Kumbakonam, Nataraja at Chidambaram (founded, Twelfth Century), Arunachalesvara at Tiruvannamalai (Sixteenth Century) and Vriddhagirisvara at Vriddhachalam (founded, Sixteenth Century). One singular feature is quite inescapable: in the statuary of sacred dance, and no matter the Province, the Turnout is ubiquitous. And more singular still, the technical principles portrayed are as the son to the father – the father being the Indus Valley Harappan seals, that from the Second Millennium B.C. 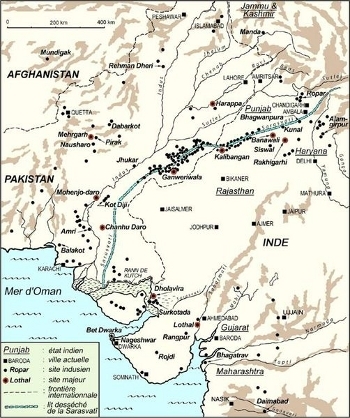 On the territory of the modern nations of Afghanistan, Pakistan and India1, was found a culture scholars know as the Indus Valley or Harappan civilisation. Lost from sight until 1920, its traces (new finds being made nearly every day), though capital to understanding the history of the world, are now imperilled by the incessant Western air strikes throughout the region. Between 2600 and 1700 B.C. the Dravidians, preceding the Indo-Europeans (Aryans), and displacing a people of Australian origin (today’s Munda), founded fabled cities in the Indus Valley, the principal ones known to us being Mohenjo-Daro, Harappa and Lothal. Built in stone and brick, these cities had the most advanced water-works of the Ancient World – well-designed reservoirs, wells and subterranean sewers, proof of their engineers’ considerable technical ability. Mathematically-inclined, the Dravidians had already invented systems of weighing and measuring to further trade with Arabia, Western and Central Asia and the rest of India. They also invented a writing-system, that scholars are now struggling to decipher, and that antedates by several centuries the proto-Sinaic inscriptions at Serabit el-Khadim. Harappan culture stretched Southwards down to what is now the State of Gujarat, near the city of Lothal on the Gulf of Khambat. At Lothal, the Bronze Age shipyards – the largest complex of seafarer’s engineering in the pre-Christian world – covered 37 x 22 metres. As for the port itself, designed for trade with Mesopotamia and Arabia, it was so vast as to harbour dozens of seagoing vessels at once. This people were familiar with the decimal system. Their bricks, churned out , as it were, industrially, are in 100 x 50 x 25 proportions. Amongst the countless items imported 4000 years ago, have been found seals from Bahrain, Sumerian terra cotta figures and Egyptian objects. A most advanced culture, therefore. 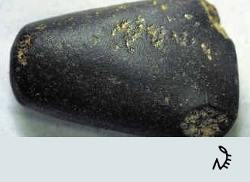 Axe-head with Dravidian inscription dating from ca. 2000 B.C. Found in the State of Tamil Nadu (South India) in 2006 by a school-teacher, V. Shanmuganathan, in his garden. The four signs correspond to ones already known to be Harappan. Scholars therefore deem the axe-head to be the first irrefutable proof that the language of South India, like that of the North, was Dravidian. The figure scratched into the middle and to the left of the axe-head (48) represents a seated divinity, with knees drawn up. The symbol marked as 48 above, corresponds to the sound MUR i.e. to «bend, contract, flex», and through the root MRK, to destroy, to kill (French: MORT, Danish MOERK, English MURKY …). This divinity would appear to be a proto-Shiva, the Dancing God who creates and destroys and who will later have amongst his notable attributes that of destroying ignorance. Discovered by Dr. V. S. Wakankar in 1958, cave-paintings at Bhimbetka in the State of Madhya Pradesh representing a proto-Shiva, are believed to date from ca. 3000 B.C. Later finds, Harappan seals from circa 2000 B.C., portray a proto-Shiva, who is invariably shown with the legs bent, and fully turned out. Archaeologists working in the Indus Valley have turned up clay pots with scratched-in designs, a very few sculptures and over five thousand of these clay seals, that are nearly 4,000 years old. The Harappan seals tell us much about the spiritual world, and thus the dance, of these, our forefathers. 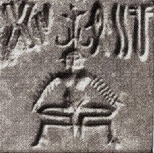 Proto-Shiva represented on the right side of a Harappan seal (ca. 1800 B.C.). Originally, the deity appears in the forest, like the Celtic deity Cernunnos. Note the Turnout, and how the humerus turns inwards and the radius outwards – a posture specific to the torso of the turned-out human being . Thenceforth, the Turnout will become a feature intrinsic to all Indian classical dancing, long before it ever reached Western Europe. Bas-relief, Shiva Temple at Thirubuvanam. Province of Tamil Nadu, Twelfth Century A.D. Note the typical humerus/radius opposed rotation. These oft-portrayed Harappan deities invariably appear in a “Yoga” posture well-known in Western Europe today: legs turned-out and bent at the knee, with the corresponding change in the torso’s posture. One should stress that the professional Indian dancer today does a “barre”, which is in fact two hours of Yoga, much of it involving work on the Turnout. Do the sacred texts ever explicitly refer to the Turnout? Against the despair and moral decay that had overtaken India under British rule, Indian nationalism was reborn early in the Nineteenth Century. Amongst these nationalists were the so-called Tanjore Quartet, four brothers named Chinnayya (1802-1856), Ponnayya (1804-1864), Sivanandam (1808-1863) and Vadivelu (1810–1845). They were all dancing masters in the State of Thanjavur, at the Court of King Serfoji II (1798-1832). 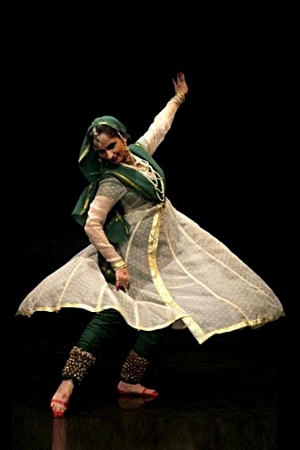 Dancer in the posture known as Tribhanga (Nritubhanga) or triple-flexion (hip-joint, waist, torso). Harappan sculpture, circa 1800 B.C. Note the artist’s attempts to properly represent the anatomy of the shoulder-joint and spine. These Four Brothers were cardinal reformers of the dance and more generally, of theatrical principles. To that end – “torniamo all’antico e sarà un progresso” - they went back to the sources, notably the celebrated Natya Shastra, penned some time around 200 (?) B.C. From a practical standpoint, it is noteworthy that Bharatamuni had already drawn a clear distinction between classical dancing, and the regional or popular dances on which it drew. Bharatamuni both comments, and expands upon, the Nata Sutras, ancient writings, probably Vedic (1700-1000 B.C. ), attributed to the scholars Shilalin and Krishashva. Veda is a Sankrit term that means Science or Knowledge (root VD, which means both to SEE and to KNOW cf. English Wit, German Wissen, Italian Vedere…). The term Vedas refers to a collection of writings. The most ancient are four in number; dating from ca. 1700 B.C., they reflect two main currents of thought: the Dravidian and that of the invading Aryan peoples. Around 1500 B.C., a scholar named Vyasa Krishna Dwaipayana compiled the four Vedas. Even today in India, the hymns of the first Veda known as the Rg Veda are recited; over time, they had nonetheless become ever more difficult to properly understand and interpret. In order that the increasingly-elusive wisdom of the four Vedas be made explicit, intelligible and accessible to all men through music, dancing and pantomime gesture, Bharatamuni stepped in and wrote the Natya Shastra, often given the title of the Fifth Veda. Therefore, the actual subject of the Natya Shastra is the search for Truth. As Dr. Vijaya Rao has brilliantly demonstrated in her study Abbild des Goettlichen, the classical dancing of the Indian sub-continent cannot be seen otherwise than as a capital expression of Indian theology and cosmology. Above, the scholar Vempathi Chinna Satyam, born at Kuchipudi, ninth generation of dancers. 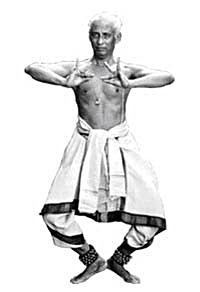 He shows one variant of the posture called Ardha-Mandali, fundamental, and thus common to all Schools of the Indian sub-continent. 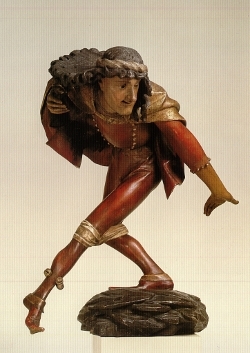 The dancer sinks to two-thirds of his height, the knees as far apart as possible. M.V. Orelskaya, a scholar from Saint Petersburg now teaching at the University of Pune in India, has undertaken to compare all existing manuscripts in India, and to draw up, for the first time, a dictionary of the dance-terms in use since earliest times. A worthwhile endeavour, to say the least, since in India “ancient” theoretical treatises like the Natya Shastra are not mouldering on a dusty museum shelf, but readily consulted by professional dancers. Paradoxically though, nowhere in any of these treatises does the Turnout, as a specific thought-object, appear. Indeed, the Indian sub-continent does not even seem to have invented a word or expression that would cover the notion! How does one explain such a paradox - since, as we have just seen, Turnout is a sine qua non for classical dancing in India? Allow us to put forward a hypothesis suggested by reviewing the available literature: in the Indian scheme of thought, many and varied as they are, there exists no technical aspect of the dance that can be split off from its sacred vocation. 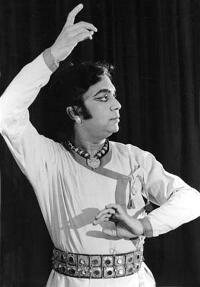 From the beginning of recorded Time in India, the Turnout has been a technical feature inseparable from sacred theatre dance. It is the Turnout that allows the artist to embrace both his Fellow Man, and the Heavens. 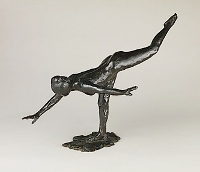 Although, to a European classical dancer, an Indian colleague in that small First or Third might at first seem but slightly turned out, the moment the latter strike a pose or begin to move, the Turnout explodes into its full and functional dynamic. Do not, however, look for an aspiration towards soaring flight: closely related to Christianity, that notion materialised only through the much later discovery of the Fifth position in Western Europe. For the Indian sub-continent, therefore,what determines the quality of Turnout is its dynamic, shown here in exemplary fashion by Professor Sharma. The Turnout is thus an attitude of one’s entire being, radiating throughout the body and mind. It is the sine qua non of expression, rather than a mere position of the feet or even the legs. Put another way: Since the Italian Renaissance, bel canto has become synonymous with correct technique. If in Europe, one asked an opera singer whether “he sang bel canto?”, he would fall about laughing. Here in benighted Europe, we nevertheless persist in believing that the Turnout is a discrete object, secreted by the feet, locked into five tightly-screwed positions. In every-day walking, the human being moves forward, not with parallel feet, but rather in a herringbone-pattern: to support the effort of standing up straight, as opposed to crouching comfortably on all fours, Homo Sapiens had no option but to turn out - slightly. Walking happens to be a purely functional activity, truly efficient only when moving forwards. And what of children in the playground, scampering, skipping and jumping about? Herringbone-pattern, yes – turnout, no! The same can be said of social and military dances, both ancient and modern. They go forwards, and, somewhat shakily, backwards. Expect no more! 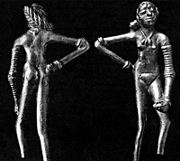 Below, a typical example of all other dance forms existing world over: a Cybelian ritual dance performed in Macedonia (Third Century B.C.) - with parallel legs and feet. Nowhere does the study of sculpture, bas-reliefs and pottery of the Ancient European World yield any example that might lead one to imagine that the Greeks or even the Etruscans – although the latter were on the very highest level of civilisation – might have known the Turnout. Grotta del Triclinio, Corneto, ca. 600 (?) B.C. Louvre Museum. Turnout is thus a very singular notion, and one that is almost certainly peculiar to the Indian sub-continent. It would be quite coherent with the keen interest in science and mathematics entertained by the Indus Valley peoples of 4,000 years ago, for scholar-dancers to have decided that stomping endlessly forwards in a herring-bone pattern was a fetter on thought. To express the Ideal, Man must free the torso and consequently, stabilise the body below the hip-joint. Thanks to the Turnout, the support polygon is enlarged, the torso can be disassociated from the lower limbs, while the entire body is as though shot upwards by several inches. Plainly, all these advantages did not escape the notice of our Harappan ancestors. In discovering the Turnout, they fathered the art of theatrical dancing. The moment Man decides to go towards his fellows and to express, through movement, ideas and emotions other than the most primitive and above all, his aspiration to the Transcendent, he seeks to explore all the planes to which the body will give access – before him, far to the side, way above, far behind. Only the Turnout opens all these doors. Each of these planes presents an infinite number of degrees, allowing him to vary and multiply the Affects in infinite ways, for example through the arabesque. Since Veit Stoss and Erasmus Grasser (15th Century), only Degas in Europe has studied the Turnout and the singular transformations it induces. Although one may be permitted to suggest that the notion of Affect in classical German psychology (J.F. Herbart) as well as in certain treatises on aesthetics from Lessing’s day onwards, does correspond precisely to that of Rasa in India, one must nonetheless own that this notion, which in Europe has remained somewhat mysterious is in India the subject of precise specifications that leave little room for woolly thinking. Very likely, the only Westerners who consciously inhabit that realm are classical musicians, but by definition, they lack all words for the torrent of very real ideas for which they are the vessel. But the Indian sub-continent has sought, and found, the words. The evening of 4 February 2012 marked the 74th birthday of Pandit Birju Maharaj, Guru of professor Sharma and was celebrated in his honour. One should stress that to Bharatamuni, these terms refer solely to theatrical events and not to everyday life. The spectator must be made aware of these three states. In Dr. Rajagopalan’s words, “It naturally follows that what they produce should only be ’natya rasa’ (sentiments pertaining to the dramatic spectacle). One enjoys experiencing the emotions with the artists, and sometimes even visibly expresses it by shedding tears or laughing spontaneously. But both the artist and the spectator are well aware that neither of them is going through it in reality. This enjoyment is ’natya rasa’." Joy and sorrow are, as such, elementary affects. What is proper to art, and most especially, sacred art, is to transcend the elementary. Without the Turnout, it would have been impossible. We have just seen that no dance form known to the Western world did use the Turnout. Then, in a jangling of bells, the Moriskentänzer - the Moorish Dancers – arrived prancing through town and village in Germany and Austria. So unusual was their skill that noted draughtsmen such as Israel von Meckenem stooped, as it were, to depict them. The existence of these strolling players, and the fact that they were turned-out, is from then onwards well documented. Our hypothesis is that these strolling players were in fact dancing Troubadours from the Muslim Courts of Andalusia, who, as those Courts declined, fanned out to the German-speaking principalities. But where, and from whom, had they learnt the Turnout? Along the Silk Road, from Indian mountebanks eking out a living at the caravanserai? Or were they rather offshoots of dancing dynasties, brought to Andalusia from India centuries earlier to amuse the Caliphs? King David dancing before the Ark of the Covenant. 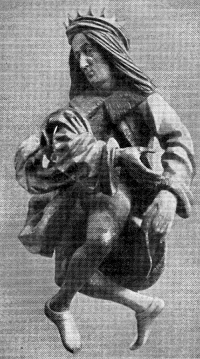 Veit Stoss, Marienaltar, Cracow, ca. 1480. 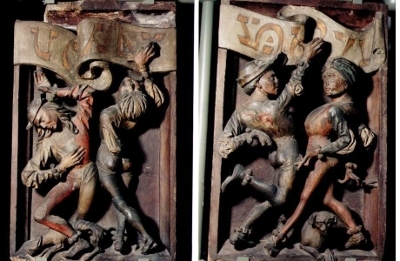 In 1480, the architect and wood-carver Erasmus Grasser created ten figures known as The Moorish Dancers (Moriskentänzer) in lime wood for the Munich Town Hall’s ballroom. He has represented the Turnout with the anatomical precision of a wonder-struck scientist. Of truly exceptional ability, Veit Stoss and Erasmus Grasser were already in their own day, world-famous. How comes it then that both were struck dumb by a pack of strolling players? Evidently, their scientist’s eye had promptly noted that it was the Turnout that had given these outlandish pranksters a technique, whose vigour and expressive power was about to provoke a revolution. Straightaway, the two draughtsmen delved into the anatomic principles that govern the Turnout, and how those principles intertwine with épaulement (contrapposto or Verschränkte Bewegung in the language of art history). Indeed, Veit Stoss goes so far as to shew David picking up the folds of its garment, in order that we may all admire how well turned-out he is, while Erasmus Grasser depicts The Bridegroom (his Moriskentänzer are carved in tutto tondo) tossing up his cape, that one may observe just how the Turnout transforms the insertion of the muscle onto the bone! So great was the admiration and astonishment unleashed by the Moorish Dancers that around 1500, Niklas Türing the Elder actually portrays them dancing wildly along the bas-reliefs of the Imperial Residence at Innsbruck, At the Sign of the Golden Roof. Above the dancers, appear Hebrew letters arranged into “words”, the meaning of which Niklas Türing could not have known. Scholars now consider that he placed the Hebrew letters there, somewhat naïvely, to signify, that the Dancers came from “the Orient”. Niklas Türing the Elder, ca. 1500. At the Sign of the Golden Roof, Innsbruck. The Temptation of Saint Anthony, ca. 1506. Although there is reference to Turnout in the art of the early Italian Renaissance (not even in Guglielmo l’Ebreo! ), one example nonetheless does give rise to doubt: the Danza dei Nudi of Antonio del Pollaiolo (fresco, 1460-75, Villa la Gallina, Arcetri). It coincides – can it be pure chance? – with the arrival of the Moriskentänzer in Southern Germany. 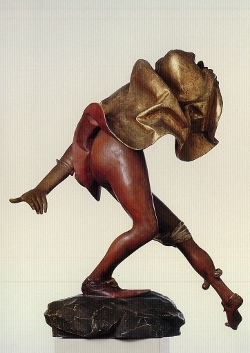 When at Padua, in 1545, the first professional theatrical troupe in Europe was founded, shortly to become known to the world as the Commedia dell’Arte, in order to succeed these mountebanks had necessarily to add dancers to their ranks. Another hypothesis, and not so bold perhaps as it might seem: the Italian commedianti may, indeed must, have crossed paths with the strolling Moorish Dancers, been gobsmacked by what the latter could do with the Turnout, and illico presto adopted it. Which may well be how the Turnout got to France in the late Sixteenth Century – in the Commedia’s baggage. So fantastic an arsenal of means did the Turnout give the dancer that it spread like wildfire throughout Europe, enabling classical dancing to become, over the course of the Eighteenth Century, the vast and sweeping theatrical art form that we know today. Unfortunately, however, an empiricist and sceptical train of thought of the Voltairian ilk, paying lip-service to the Goddess Reason only to deny Metaphysics, has had an especially noxious influence on European art forms. For the empiricist, the Turnout means nothing save forced positions of the feet, and the dance, a distraction for Courts and courtesans, no sooner seen than forgotten. May these our discussions in the shade of the Tree of Life help to draw it along another path. With thanks to Professor Vijaya Rao, author of the study entitled Abbild des Göttlichen (Hermann Bauer Verlag, 1987), to Kenji Usui of the Japan Ballet Association and to Professor Gertrude Krombholz of Munich. 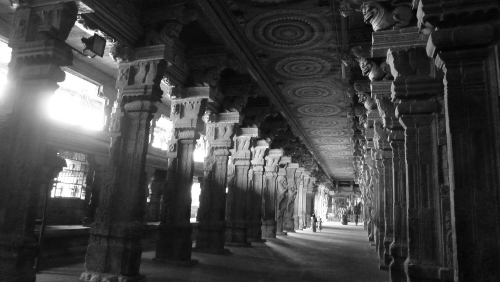 Bindu S. Shankar, Dance imagery in South Indian Temples: Study of the 108-Karana sculptures .